The total polyphenol content of onions is much higher than many people expect. (Polyphenols are one of the largest categories of phytonutrients in food. This category includes all flavonoids as well as tannins.) The total polyphenol content of onion is not only higher than its fellow allium vegetables, garlic and leeks, but also higher than tomatoes, carrots, and red bell pepper. In the French diet, only six vegetables (artichoke heart, parsley, Brussels sprouts, shallot, broccoli, and celery) have a higher polyphenol content than onion. Since the French diet has been of special interest to researchers in terms of disease prevention, onion’s strong polyphenol contribution will very likely lead to follow-up studies that pay closer attention to this unique allium vegetable. Within the polyphenol category, onions are also surprisingly high in flavonoids. For example, on an ounce-for-ounce basis, onions rank in the top 10 of commonly eaten vegetables in their quercetin content. The flavonoid content of onions can vary widely, depending on the exact variety and growing conditions. Although the average onion is likely to contain less than 100 milligrams of quercetin per 3-1/2 ounces, some onions do provide this amount. And while 100 milligrams may not sound like a lot, in the United States, moderate vegetable eaters average only twice this amount for all flavonoids (not just quercetin) from all vegetables per day. When onions are simmered to make soup, their quercetin does not get degraded. It simply gets transferred into the water part of the soup. By using a low-heat method for preparing onion soup, you can preserve the health benefits of onion that are associated with this key flavonoid. When we get quercetin by eating an onion-rather than consuming the quercetin in purified, supplement form-we may end up getting better protection from oxidative stress. That’s exactly what happened in an animal study where some animals had yellow onion added to their diet in a way that would provide the same amount of quercetin provided to other animals in the form of purified quercetin extracts. The best protection came from the onion version of this flavonoid, rather than the supplement form. Several servings of onion each week are sufficient to statistically lower your risk of some types of cancer. For colorectal, laryngeal, and ovarian cancer, between 1-7 servings of onion has been shown to provide risk reduction. But for decreased risk of oral and esophageal cancer, you’ll need to consume one onion serving per day (approximately 1/2 cup). With their unique combination of flavonoids and sulfur-containing nutrients, the allium vegetables—such as onions—belong in your diet on a regular basis. There’s research evidence for including at least one serving of an allium vegetable—such as onions—in your meal plan every day. When onion is your allium vegetable of choice, try to consume at least one-half of a medium onion on that day, and use this guideline to adjust your recipes accordingly. For example, if you are following a recipe that yields 4 servings, include at least 2 medium onions in the recipe so that each of your 4 servings will contain at least one half medium onion. To bring out the sweet flavor of onions we recommend using our Healthy Saute method of cooking onions for just 7 minutes. Cut onions into slices of equal 1/4-inch thickness to help them cook more evenly. The thinner you slice the onions the more quickly they will cook. Let them sit for at least 5 minutes to enhance their health-promoting properties. For more details see the Healthiest Way of Cooking Onions in the How to Enjoy section below. * Combine chopped onions, tomatoes, avocado, and jalapeno for an all-in-one guacamole salsa dip. * To perk up plain rice, top with green onions (scallions) and sesame seeds. Healthy Sauteed chopped onions can enhance the flavor or almost any vegetable dish. * Enjoy a classic Italian salad—sliced onions, tomatoes, and mozzarella cheese drizzled with olive oil. Cut onions into 1/4-inch slices to cook them evenly and quickly. Let them sit for at least 5 minutes to help enhance their health-promoting benefits. While many people love to eat onions, most dread cutting them since this process usually brings a tear or two to the eyes. The substance that causes the eyes to burn is a special gas that has been named lachrymatory factor (LF). (The full chemical name for this gas is propanthial S-oxide, and it is made from a naturally occurring compound in onion called 1-propenyl-L-cysteine sulphoxide.) Recent research has shown that LF gas is not produced through activity of onion's alliinase enzyme, but rather through the activity of a special enzyme named lachrymatory-factor synthase. Interestingly, even though lachrymatory-factor synthase is the enzyme responsible for production of LF gas, the alliinase enzyme must still be present in order for LF gas production to occur. Of course, no sooner had this new tear-producing enzyme been discovered than researchers began looking for ways to switch off the gene that served as the blueprint for this enzyme. 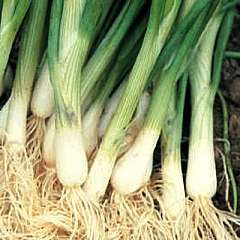 However, "silencing" the gene without compromising the health benefits of the onion turned out to be a difficult task. Even though researchers in Japan succeeded in shutting down the gene and preventing production of lachrymatory-factor enzyme (thereby paving the way for a genetically engineered onion that would not produce LF gas and cause tearing), they also determined that the shutdown of the gene caused significant (and mostly unwanted) changes in the overall mixture of sulfur-containing molecules in onion. If cutting onions irritates your eyes, there are a few tricks that you can employ. Use a very sharp knife and always cut the onions while standing; that way your eyes will be as far away as possible. Consider cutting onions by an open window. If cutting onions really makes you cry, consider wearing glasses or goggles. Chill the onions for an hour or so before cutting; this practice can slow down the onion's metabolism and thereby lessen the rate of LF gas production. Cutting onions under cold, running water is a method that is often used to cut back on eye irritation, but it's a method we view as a second-best choice since some of the nutrients found in onion can be lost into the flow of water. The outstanding polyphenol content of onions (including their rich concentration of flavonoid polyphenols) is probably the most overlooked nutrient content of these allium vegetable. Among the flavonoids, onions also provide a particularly large amount of quercetin. A wide variety of allyl sulfides are found in onion, including the four major diallyl sulfides: DMS (diallyl monosulfide), DDS (diallyl disulfide), DTS (diallyl trisulfide), and DTTS (diallyl tetrasulfide). Also present are a wide variety of sulfoxides, including (+) S-methyl-L-cysteine sulfoxide (MCSO), (+)-S-(1-propenyl)-L-cysteine sulfoxide (PRENCSO), S-methyl-l-cysteine sulfoxide, S-propyl-l-cysteine sulfoxide, and S-propenyl-l-cysteine sulfoxide. Onions are a very good source of biotin. They are also a good source of manganese, vitamin B6, copper, vitamin C, dietary fiber, phosphorus, potassium, folate, and vitamin B1. For an in-depth nutritional profile click here: Onions.